A ROCKING HORSE is one of those toys that never seem to lose its appeal. The rocking horse is more likely to be passed down the generations or from family to family than any other toy. Too often though, the toys are rather ﬂimsily made and simply don’t last. 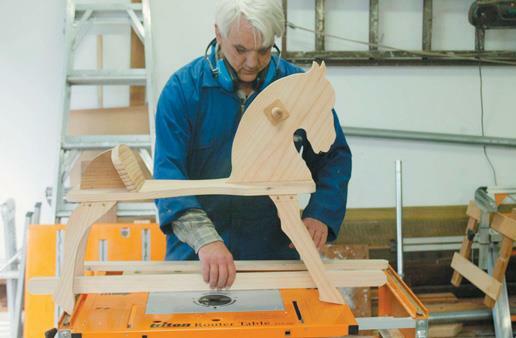 This rocking horse is solid, safe and easily constructed. In some respects I have over-engineered the toy, especially in the base which is heavy for stability. Rocking horses with lighter platforms tend to skitter across the ﬂoor. I usually make a template ﬁrst since you will ﬁnd that one rocking horse is not enough – before long you are being asked to make a ﬁeld full of them. Draw the plans out on cardboard or directly onto a piece of ply or 13 mm MDF. Machine these carefully and smooth the edges. Mark up the legs together on straight-grained timber, keeping the grain running the length of the legs. Remember to draw two copies of each leg - left and right. 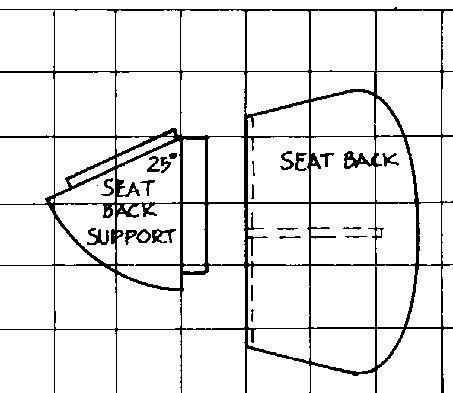 The seat-back and rounded seat-support or rump behind can be marked up but these will require some treatment before they are shaped. The legs are loosely cut to shape with the bandsaw and the templates temporarily attached. 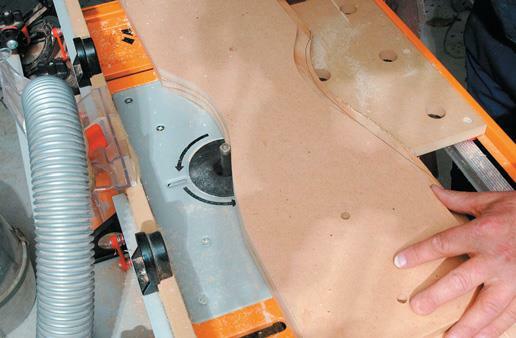 Trim the legs flush with a flush trim pattern router bit. Take care at the ends which can have a tendency to chip out especially on the cross-grain cut; I usually cut the ends on the saw to avoid chip-out. Rough-cut the base of the horse body to size on the table saw. To ensure that the curves on both sides are equal, I tend to make a template of the curves on one side and apply this to the actual template on both edges so they have the same outline. Before cutting the external curves of the body, mark the position of the mortise slots in the base and set the router with a straight 12 mm bit. 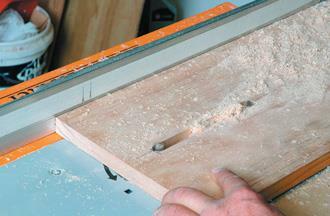 Cut the slots either with a jig or directly on the router table with a fence. Do this in a series of easy passes rather than trying to cut the whole thing at once. I usually take three or four passes. Mark a couple of stops on the router fence to indicate where to start and stop. With the slots cut, the rest of the body can be shaped on the bandsaw or a jigsaw and cleaned up on the router with the flush trimming bit. Alternatively, if you don’t have a router table you could cut the outline closer on the jigsaw or bandsaw and cut the curves with a spokeshave. Marking out the components note the orientation of the legs with the grain. Trimming the parts to size saves time on the router. Cutting the mortises for the head and tail in the body. To cut the dovetail I generally start by cutting a smaller mortise with a 9 mm straight bit, using the same set-up. The 9 mm mortise lessens the strain on the dovetail bit, leaving it only the edges to cut. 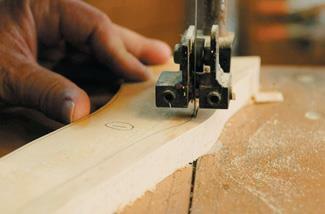 It is useful to practise the cut ﬁrst on a scrap piece to ensure that you have the correct depth etc. You have only one go at cutting the sliding dovetail. Once the dovetail mortise is cut, the bevel angle at the base of the seat-back needs to be cut. There are a number of options here and your equipment and your own preference will determine which method you use. I tend to cut it on the buzzer but equally it could be cut on a table saw with the blade angled. 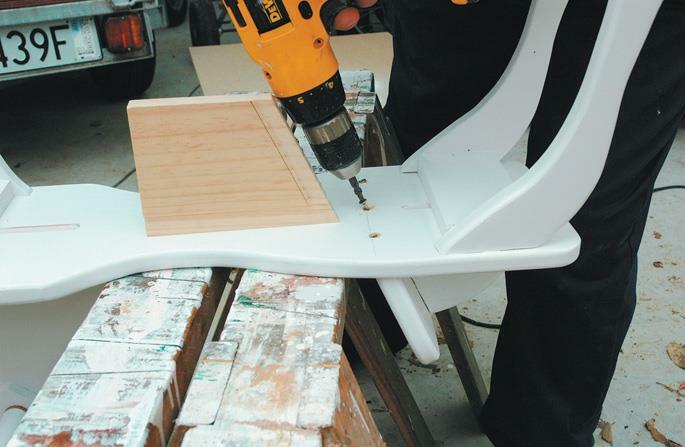 It is a good idea to cut out the seat-back angle on the rounded seat-back support or rump and transfer this angle with a sliding bevel gauge to the buzzer fence or the saw blade. That eliminates the possibility of errors. 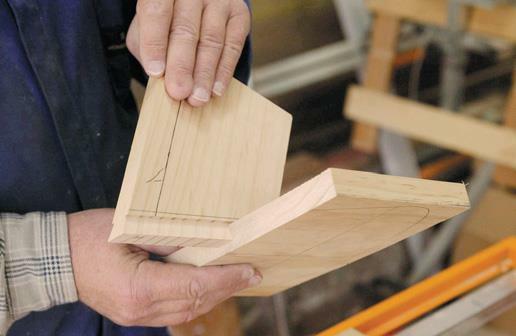 The rounded seat-back support template is made oversize to accommodate the dovetail tenon and the tenon in the base. Cut the dovetail on the router, taking careful gradual passes on each side until it ﬁ ts snugly into the dovetail mortise. Now change to a straight router bit and again shape the bottom mortise to 12 mm, ﬂipping the piece with each pass to keep the mortise centred and taking small bites each time. Both the sliding dovetail and the base tenon will need to be trimmed to size to ﬁt their respective mortises. You can now cut and shape both the seat and its support piece. Flush trimming the parts with the template in place. Cutting the sliding dovetail in the seatback before shaping it. The head will need to be cut with a scroll saw or a coping saw. The angles are a bit too tight for a bandsaw, but a bandsaw can be used to rough out the shape. The ﬂush trimming bit can also help on the broad sweeps. The head too is held in place with a through-mortise. This is cut in the same manner as the seat support. Once cut, the mortise will need to be cut to size at the base and trimmed to ﬁt. Routing the tenon to size in the seat support. Testing the ﬁ t of the sliding dovetail. Cut two support blocks for the legs and position them. Temporarily screw them to the base in the position you want. Then, holding a leg to each end, in turn drill and countersink the 2.5 mm holes for the screws. Screw in the legs. 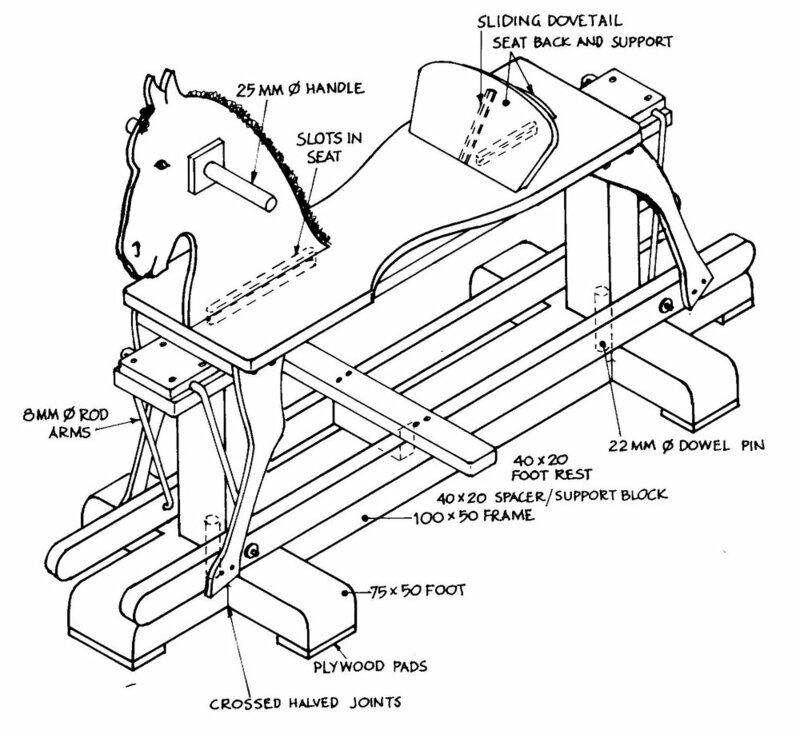 The lower rails carry the horse itself and help to strengthen the legs. They are screwed to the feet and the footrest will be fastened to them to provide lateral support. Testing the ﬁt of the tenon. The base is constructed of 100 mm x 50 mm timber with 75 mm x 50 mm crosspieces and uprights. It is possible to use lighter timber but I have found timber of these dimensions to be strong and sturdy, the weight helping to keep the horse in one place. The base has two crosspiece supports that are double half-lapped for rigidity. In the base and the intersecting crosspiece, cut out on the table saw the wide notches that will overlap. Once they ﬁ t snugly, shape the ends of the base and sand them smooth. Round off any exposed edges, taking care not to round over the section that mates with the crosspieces in the base. Glue the base together and add a couple of screws through the base to secure the crosspieces to the centre of the base. Add pads beneath all the feet. Directly above the intersection of each crosspiece, the uprights hold the top crosspiece. The uprights can be substituted for turned columns for an additional touch of class. The top piece is 750 mm x 90 mm x 20 mm. The uprights are held in place with a 22 mm dowel, simply the size I had to hand. Nearly any size would do but it is best to use a substantial one if possible. After cutting the uprights to size, bore a 22 mm hole in the centre of the intersection of the base and crosspieces at both ends and bore each end of the uprights. 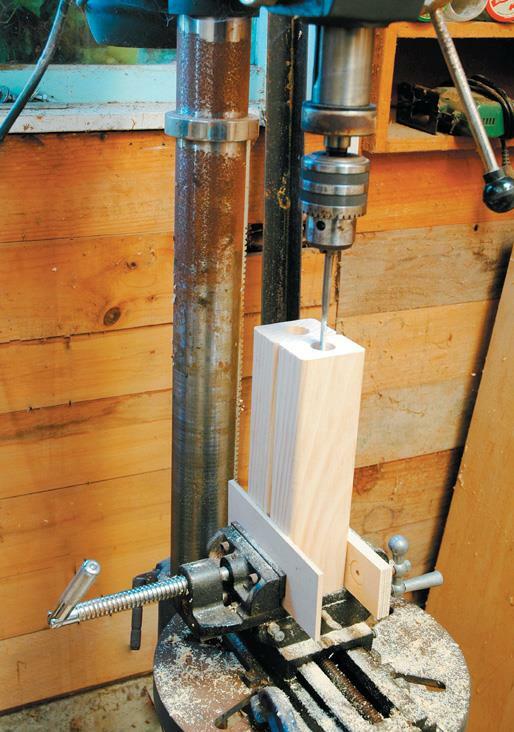 I held the uprights in a vice on the drill press but they could be bored with a brace and bit. Measure the depth of the dowel holes and cut the rod a little undersize. I do the same to the top and, depending on the material and ﬁnish , you could use this to decorative advantage with a wedged tenon joint perhaps. With the top crossbar rounded off and sanded, the base can be fully assembled. Establishing the position of the rails. The swing arms are made from 6-8 mm mild or spring steel. I used heat to bend them, bringing the temperature of the bends up until they were red-hot then immediately quenching the steel piece for stiffness. Leave sufﬁcient steel at the ends for the swingers to protrude through the lower rails so a washer and spring cap can be attached. In the top piece cut a slight groove to accommodate the swinging arms. In the more traditional models, the swingers are held with a steel hinge bracket. In the absence of these, I usually use a piece of ply with a groove cut to hold the swing arms. This is screwed to the top crosspiece but not glued. It allows you to get to the swingers to adjust their action or lubricate them if they are not running freely. You can experiment with the positioning of the swinging arms. Varying the placement will alter the swinging motion of the horse. Boring the dowel hole in the base. Set up for boring dowel hole in uprights. Drill a 25 mm hole for the dowel handle for the horse head where marked. Reinforce the handle with a shaped piece of ply either side. This gives more support to the handle itself and prevents it wearing away the hole and becoming loose. Dry-assemble all the pieces of the horse to check for ﬁ t and action etc. Once you are satisﬁed with this test, take the assembly apart, round off all the edges and sand everything. Now glue and screw the leg supports, legs and leg stretchers. It is a good idea to paint the parts at this stage, remembering to tape the tenons in the head and rounded seat-back support to allow them to be glued in later. Once dry, the head and seat support can be glued in place and the seat-back can be screwed through the base at an angle. The mane and tail are made with strips of ﬂeece on sheepskin, glued in place and with the wool teased out. Nylon cord unbraided and teased out will also make a good tail. Feed the swing arm tabs carefully into the holes in the leg rails and add the washers and end caps. Mount the swingers in place on the top crosspiece of the base and screw the capping pieces over them. Determine the best position for the foot rail and screw this in place. Clean up any rocking horse droppings and save them – they are really good for the garden. Fetch the jockey – the mount is ready. Screwing the mounting screws in the seat back, The old template piece serves as a guide.